I love having lunch on the patio at Provence. Great place to people watch and eat good, French food. The quick bite lunch is very affordable $23 and you get a appetizer and main dish. I love getting the plat de jour, they have seasonal fresh seafood. The spot prawns are absolutely delicious. The dinner and brunch are also great. 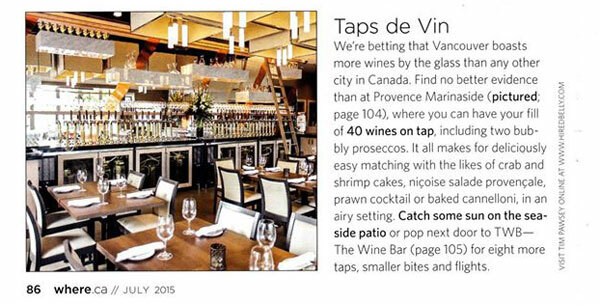 Good wine list as well 🙂 definitely recommend Provence if you’re in the Yaletown area looking for a good place to eat. We had the lobster menu and it was outstanding. The waitress was just super and the place was hopping. Everything was finely done with a great selection of pre, during and post beverages. The lobster was divine. We cannot speak high enough of this place. It has become my family’s regular morning breakfast spot. The servers are fantastic and the food is fresh. You can tell ingredients are local and fresh (although I haven’t confirmed that). Jared and Ben usually serve us and they are awesome and always interact with our little son. Last two times we have come in the food was served hot and ready so fast It’s like they knew we were coming (and our order is very specific). Great restaurant, atmosphere and view!! !